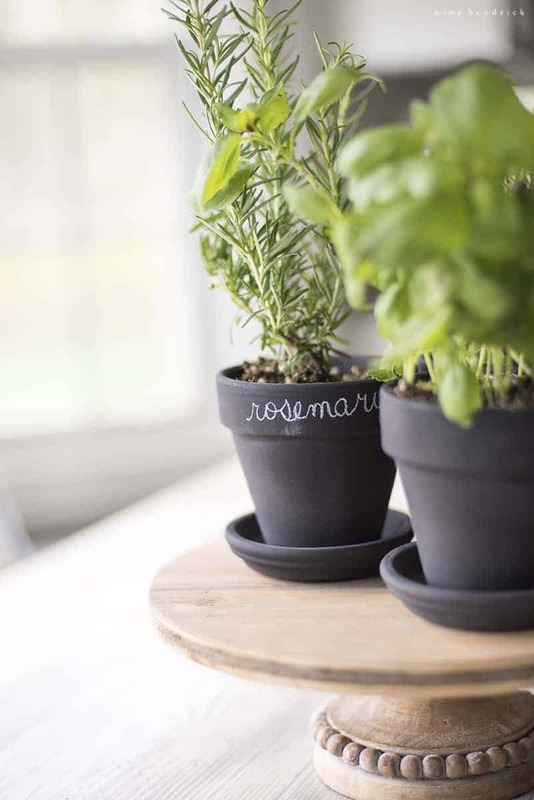 Chalkboard Herb Pots | Looking for a last-minute teacher or Mother’s Day gift idea? 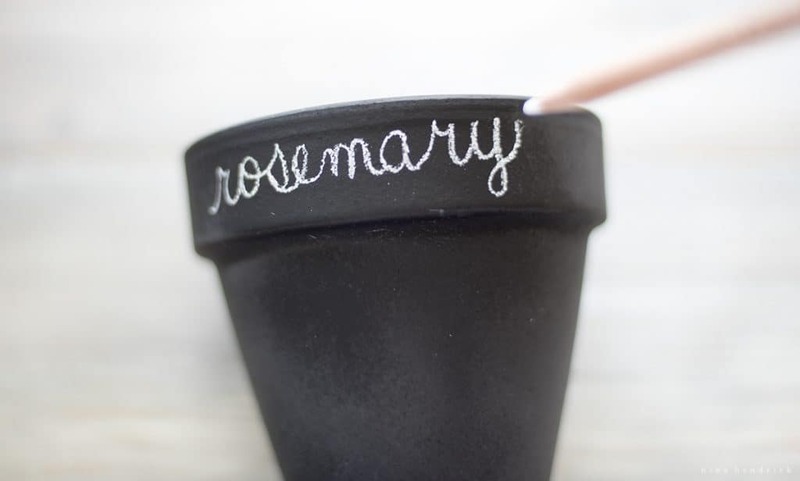 These chalkboard herb pots are a quick and easy craft to do with your children and a perfect gift idea for Mother’s Day and spring! 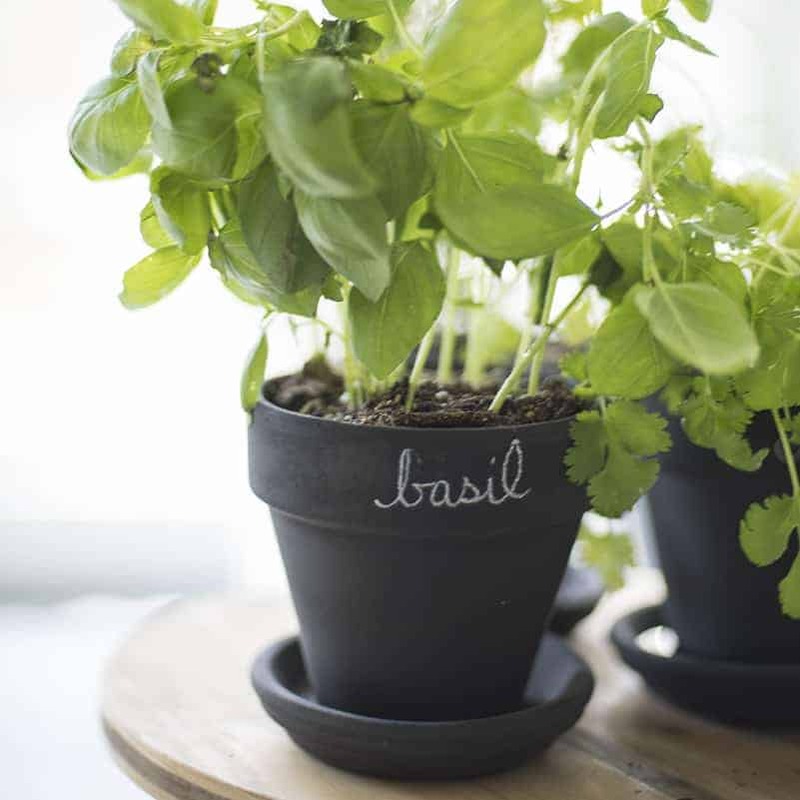 There’s nothing like the smell of fresh basil in the kitchen to let you know that summer is on the way! 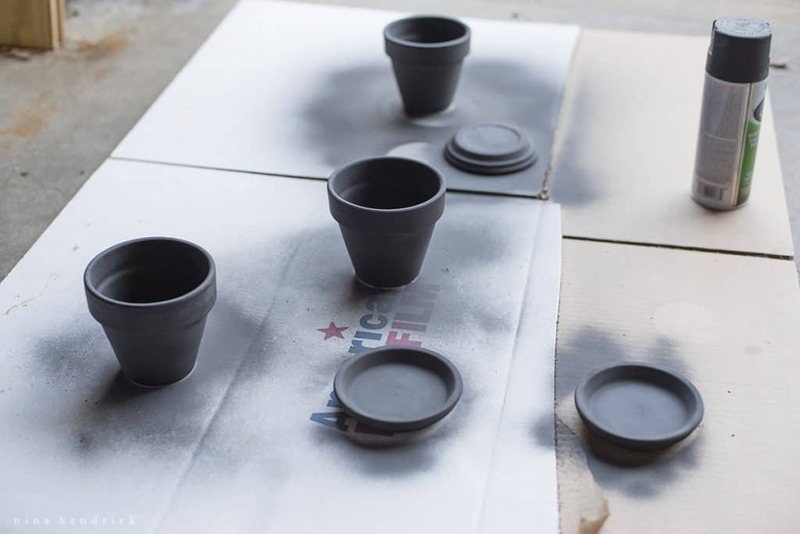 I originally wrote this tutorial over four years ago, but these chalkboard pots have stood the test of time. We bring them back out every summer when fresh herbs reappear in the grocery store! I thought I would give this tutorial a little love with some updated photography and instructions. This is the perfect craft to do with little ones for Mother’s Day or spring in general! 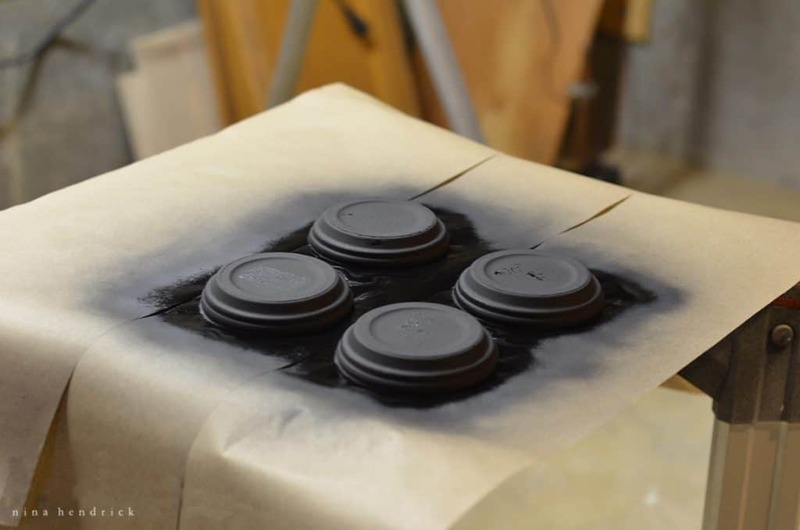 Simply swap out the spray paint for chalkboard paint in a bottle and some foam brushes, and you have a fun and easy craft! Kids will be so proud of their creations. Lay out your masking paper, or whatever you are using to protect the surface you are spraying on. Then set out your pots and their saucers. Mine had stubborn residue left behind from the price sticker. This is a nifty little trick that I learned after countless hours of picking off stickers from my collection of glassware. Acetone nail polish remover works perfectly to break up the adhesive on glassware, so I keep these little disposable pads right in the drawer. Using acetone on the porous terra cotta was a bit of a gamble, but it worked perfectly. If you find yourself with a similar dilemma, just make sure to use a light hand- you don’t want to kill your herbs with acetone right out of the gate. If the sticker is on the bottom of your pot, I wouldn’t even worry about the residue. Unfortunately for me, as you can see, mine was right on the side, and it wouldn’t take the paint evenly. 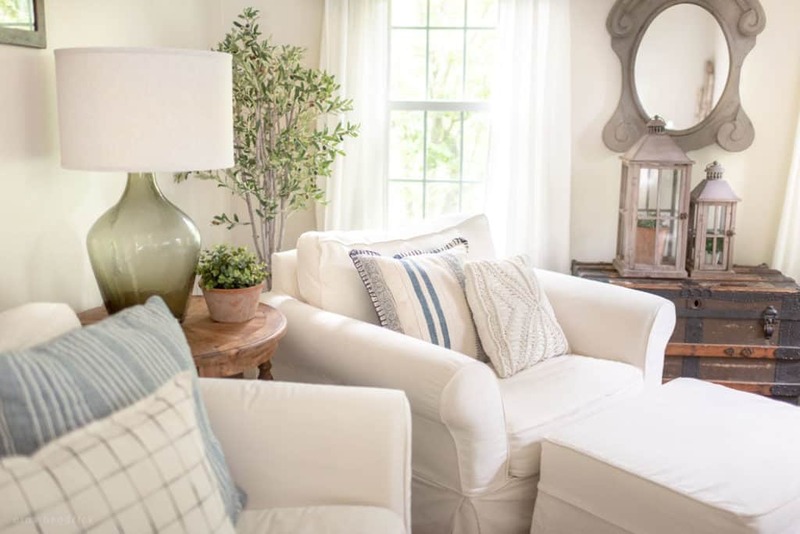 Spray a light coat on each piece. Allow 20 minutes to dry, and repeat. After the second coat has dried, flip each piece and repeat on the opposite side. This will probably take 2 coats as well. The spray paint directions state to rub the pieces all over with chalk and then wiped it off. However, I skipped this step in favor of a smooth finish. 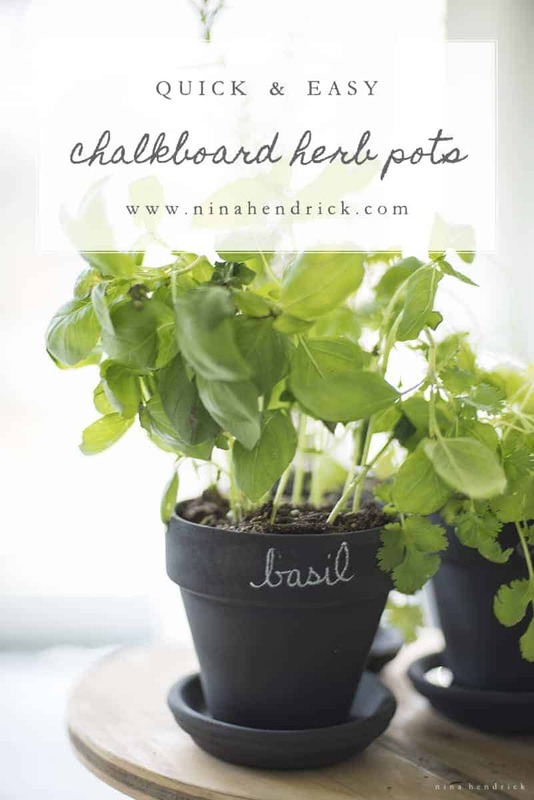 Write the names of the herbs on the pot with your chalk pencil at this point, before you add your plants. I waited until after and it was a pain. Another optional addition was adding a felt pad to the bottom of the saucer. I didn’t love the idea of my shelves being marked up! Add your plants to the pots, supplementing with potting soil as needed. 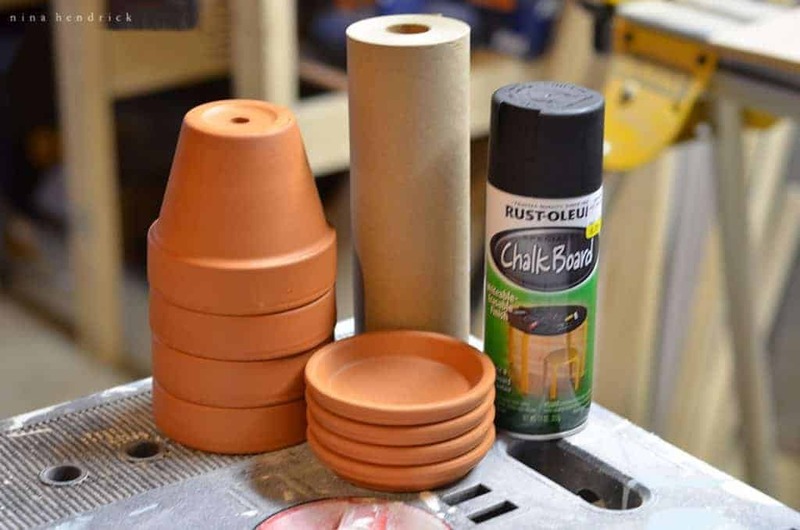 Make sure you allow the chalk paint to dry before you water your plants since the terra cotta will absorb the water and make the wet paint runny. These herb pots are so cute. 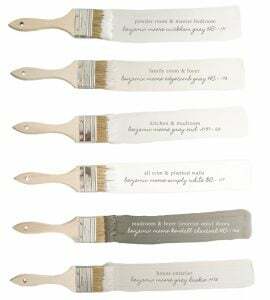 They would be great for a kitchen window sill or a gift basket for anyone who loves to cook. You’ve inspired me to make a few. That is so cute. I never thought about doing that, but I think I will buy me some pots and make them. Thank you.